With so many styles and options available today, choosing the perfect crib for baby can be a daunting task. Determine your price range and decide which crib features are most important to you. Then let the hunt begin for the best crib begin! Here are some important crib features to get you started on your quest. Any new crib you purchase is supposed to meet minimum government requirements. These requirements changed as of 2011, so it's a good idea to familiarize yourself with the latest crib safety standards before you shop. If you assemble your crib to the manufacturer's instructions and use it properly, even the least expensive crib should be safe for baby. Occasionally, an unsafe crib slips through, though, so keep an eye on current baby products recalls, just in case. A safe crib should have a firm, tight-fitting mattress, no missing or broken hardware or slats and no cutouts in the head- or foot-boards. Slats should be no more than 2 3/8" apart (the width of a soda can). Corner posts should not be higher than 1/16". Crib safety standards changed in June 2011, and those familiar cribs with drop-sides are no longer considered safe. Drop Sides or Stationary Sides? Traditionally, baby cribs came with stationary sides, single-drop sides, or double-drop sides that slide down, or drop-gate sides that fold down. While drop sides are considered convenient, history shows us that they present serious safety issues. According to the new crib safety standards, manufacturers are not be allowed to make new drop-side cribs. Wheels are a very useful feature. Check the casters to make sure they aren't flimsy because you'll be moving the crib to vacuum under it, change sheets or fetch toys. If you aren't sure if you'll need them, leave them off the crib but keep them nearby. You'll probably want them on the crib by the time the baby is 3 or 4 months old. If you fall in love with a crib that doesn't have wheels already installed, you can buy furniture caster wheels at the hardware store and install them yourself. Adjustable mattress height is available on all but the most inexpensive cribs. It allows the mattress to be higher in the crib so you can gently lay down a sleeping newborn, then lowered for babies who can pull up. At least two mattress heights are nice, three is even better. Check out the way the mattress is held up. There's a lot of variation in crib mattress supports. 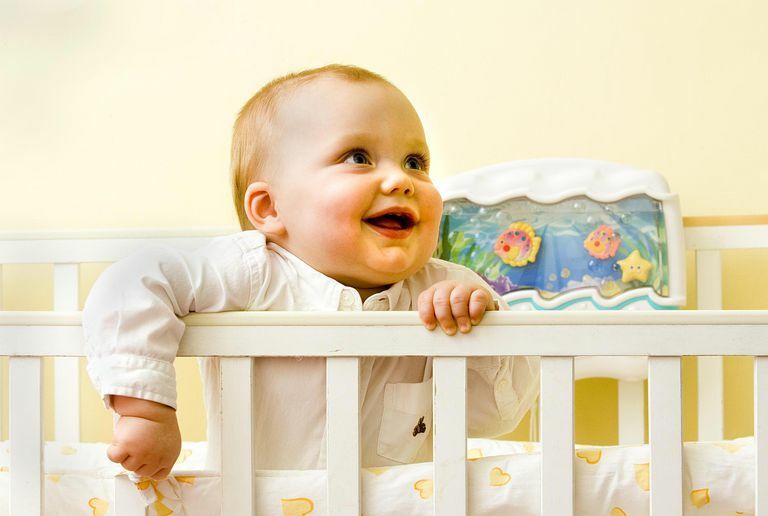 Some cribs have wood slats or metal bars as mattress support, while others use a metal frame with crisscrossed wires. The wire springs tend to be the sturdiest choice. Part of the new crib safety standards from 2011 is stronger requirements for the mattress supports to prevent collapse. Convertible cribs are attractive to many buyers, but the added expense may not be worth it to some parents. Some cribs are convertible to toddler beds, others to full-size adult beds. Most cribs require an extra kit to be fully convertible, so ask about the cost before you make your final decision on a convertible crib. Also, ask yourself whether you'll actually convert the crib or whether you'll reuse the crib for siblings and buy a separate toddler bed. Many toddlers can move right to a twin bed, so you could also skip that step to save money. Baby mega-stores have the largest selection of baby cribs in both price and style. They have a few models in stock but order others, which can take up to 12 weeks. Order early in case of delays. Many new parents are surprised at how long it takes for their baby's crib to arrive. Local baby shops usually carry premium crib brands at mid to premium prices. They often don't keep cribs in stock, so every crib is a special order. However, your local baby store likely offers the most personalized service, and will probably spend more time with you in order to find the crib you really want. Stores such as Walmart or Target usually carry a limited number of crib styles, but often have those cribs in stock. If you want an inexpensive crib without the hassle of ordering, these stores can be a good choice. Inexpensive cribs look better than ever, so a small budget doesn't have to mean you sacrifice style. Department stores may also sell cribs, usually at low- to mid-range prices. Most department stores don't keep the cribs in stock, though, so you'll probably have to order one. Websites have a wide range of crib brands and models, but shipping might be pricey. If there's a problem, returning the crib also could be difficult. Be clear on return policies before you buy. Some families have reported noticeable damage to the crib from shipping, too. If you're close to an IKEA store, take a look at their modern, inexpensive cribs. The simple Sniglar crib has a rock-bottom price and can be dressed up or remain minimalist. Be wary of used cribs. New information on drop-side cribs indicates that re-assembly is often done incorrectly, which can endanger the baby. Missing hardware or worn-out pieces are also potential problems. Several crib companies have gone out of business in the past few years, too, meaning you could be stuck with a used, recalled crib and no one that will take it back.